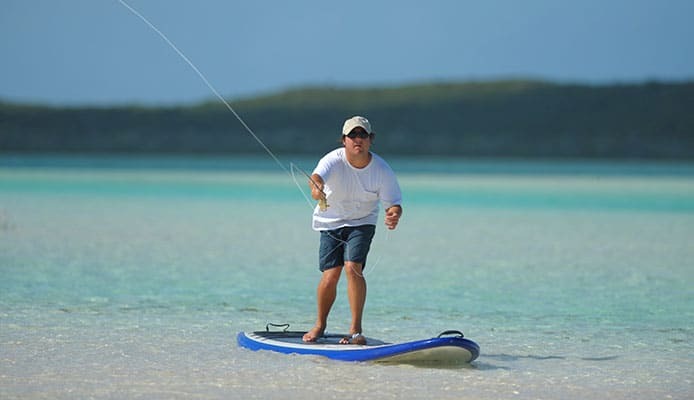 Stand up paddle board fishing; the newest way for fishing lovers to fish. Everyone knows about fishing kayaks, but what about fishing paddle boards? Recently, paddle boards are being sold specifically for fishing, containing fishing rod holder, fish finders, and bungee cords at both the front and back end of the board, creating a secure place for tackle boxes and coolers. As they’ve quickly become one of the most popular outdoor equipment in sales, fishing paddle boards are completely revolutionizing the fishing world. Both pro anglers and casual anglers are able to experience fishing in a whole new way with several new benefits. Fishing paddle boards are so new on the market that it’s difficult to tell how well kayak fishing stands up to stand up paddle boards. The biggest issue with any kind of fishing is transportation. If you have a small car, bringing a kayak anywhere is almost impossible and turns away a lot of new anglers. Fishing paddle boards solve this issue in a variety of ways. You can buy an inflatable fishing paddle board. Rolled up, these take about as much room in your car as a sleeping bag does, and take about 15 minutes to pump up with a hand pump. Whether you’re going on vacation or just taking a trip to your local lake, inflatable fishing paddle boards are convenient and light. If you don’t like the idea of an inflatable fishing paddle board, you can buy an epoxy fishing paddle board. These don’t deflate, but they’re lighter than a kayak and easy to attach to the top of any vehicle. Most can even fit in the backseat of many cars. In general, fishing paddle boards are much lighter than fishing kayaks. Many people, perhaps even you, struggle to life a fishing kayak. If you’re trying to fish solo, then trying to load a heavy fishing kayak isn’t always a possibility. Fishing paddle boards have some significant advantages in fishing compared to fishing kayaks. True to its name, stand up paddle board fishing requires you to stand while you fish. This offers you a much better view of fish swimming around you and allows you to be able to properly cast compared to sitting in a kayak. 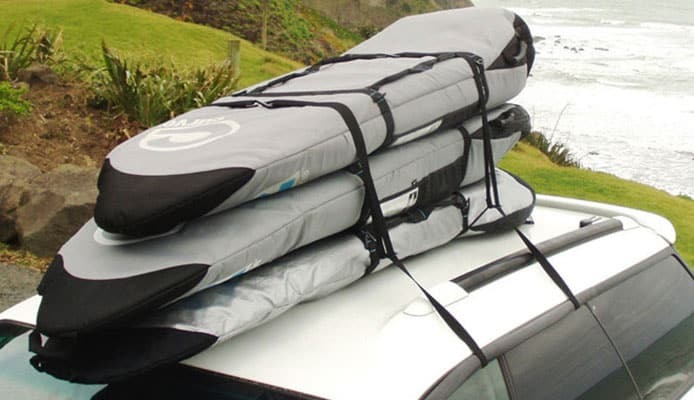 And most fishing paddle boards include bungees at the front and back end, which are perfect for holding coolers. What’s the advantage of coolers? They offer wonderful sitting places when you get tired of standing, and they hold your nice cool beverages as well. Both fishing kayaks and fishing paddle boards offer better mobility than a boat does, but fishing paddle boards are slightly easier to handle; being able to move freely allows you to turn easier compared to sitting down in a fishing kayak. Fishing paddle boards are also quieter in the water, making it easier to get closer to fish. It’s important to recognize your own exercise habits before deciding on a fishing paddle board. Stand up fishing paddle boards require standing and paddling, similar to that of a fishing kayak. However, fishing kayaks allow for you to sit, which takes off any strain to your lower body. While stand up fishing paddle boards can be a wonderful way to exercise, if you have any sort of lower body issues, particularly in your knees or ankles, it might be best to think about getting a fishing kayak. In general, fishing kayaks also require much less arm work than fishing paddle boards simply because of how they are made. However, if exercise is important to you (or you just want to start exercising more), a fishing paddle board may be the perfect fit for your life. Since they do require many more muscles than fishing kayaks, using a fishing paddle board to fish is combining something you love with a healthy exercise for your body. Fishing paddle boards and fishing kayaks are both extremely useful in different situations. If you live closer to the coast, or anywhere that typically has rougher waters, fishing kayaks are much safer. Also, some of the fishing paddle board’s advantages are rendered useless in rough waters, for example, a better vantage point for seeing fish. Fishing paddle boards require standing, so it’s easier to fall overboard if the waters are rough. Most areas where waters are rough are also pretty windy, causing another disadvantage for fishing paddle boards. When you’re standing on a fishing paddle board, you almost make a sail with your body, making it much harder to paddle anywhere. It’s also easier to lose your balance in strong winds. Fishing paddle boats, on the other hand, provide all the advantages above in calm water, such as lakes and some rivers. 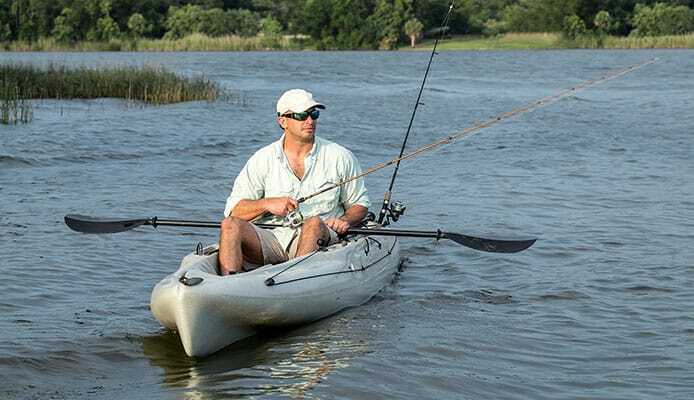 Kayak fishing doesn’t provide all the advantages that fishing paddle boards do, so unless safety is a concern, fishing paddle boats seem much better. They’re also better if you’re fishing in areas that are shallow; oftentimes, boats can’t get close to the bank because they could scrape the bottom of the body of water, and kayaks are a little harder to maneuver in tight places. Most anglers know how important fishing by the bank can be, so fishing paddle boards offer an advantage here as well. They end up costing around the same amount of money, so it’s vital for you to look at what you want out of a fishing accessary. So, Which One, Fishing Paddle Board or Fishing Kayak? You might be concerned that fishing paddle boards are less stable than kayaks simply because of the need to balance. Companies have been looking for ways to change this, and paddle boards in general get more stable every day. While paddle boards look like the much better option right off the bat, it’s important to look at your fishing habits to decide. Either way, fishing paddle boards and fishing kayaks are both wonderful alternatives for boat fishing and give everyone the chance to experience fishing.